My love affair with all things Moroccan has been well documented. I love movies set in Morocco (Casablanca and The Man Who Knew Too Much are two faves), I love Moroccan decor, and I love, love, LOVE Moroccan food. My infatuation with Moroccan food may, in fact, have begun when I first made the Moroccan Tagine with Spring Vegetables from Vegan with a Vengeance several years ago. 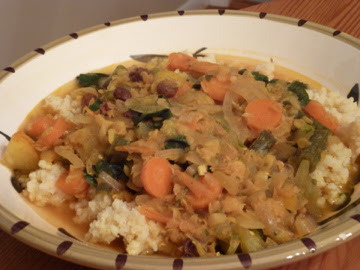 Isa's deliciously spiced stew is one of my favorite meals ever, and it is, as she says, a veritable powerhouse of nutrition. 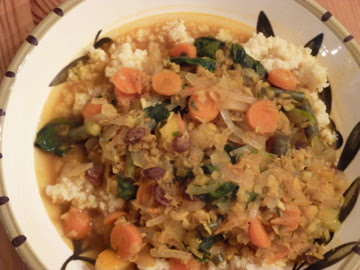 The stew is an aromatic blend of veggies (zucchini, carrots, onions, garlic, ginger, green beans, tomatoes, spinach, cilantro, mint), red lentils, and spices (cumin, turmeric, coriander, cinnamon sticks, bay leaves, pepper, and fresh lemon juice). That is a LOT of goodness in one pot! A smattering of raisins adds a slightly sweet touch, complementing the savory flavors. I think it is traditional to serve tagine over couscous, but I opted for the more nutritious millet instead.